Despite being stronger, lenders face another choppy ride in 2019. A strong League showing in the EU parliament will embolden leader Matteo Salvini to seek fresh elections, rekindling Quitaly risk. Breakingviews imagines a WhatsApp chat between a U.S. investor and Italian dealer. The spread between Italy’s 10-year government bond yields and their German equivalent bonds has more than doubled to around 290 basis points on Dec. 7 from around 140 basis points just before a March 4 general election, reflecting uncertainties about the fiscal policies of a new anti-austerity government in Rome, as well as fears of an Italian exit from the euro. 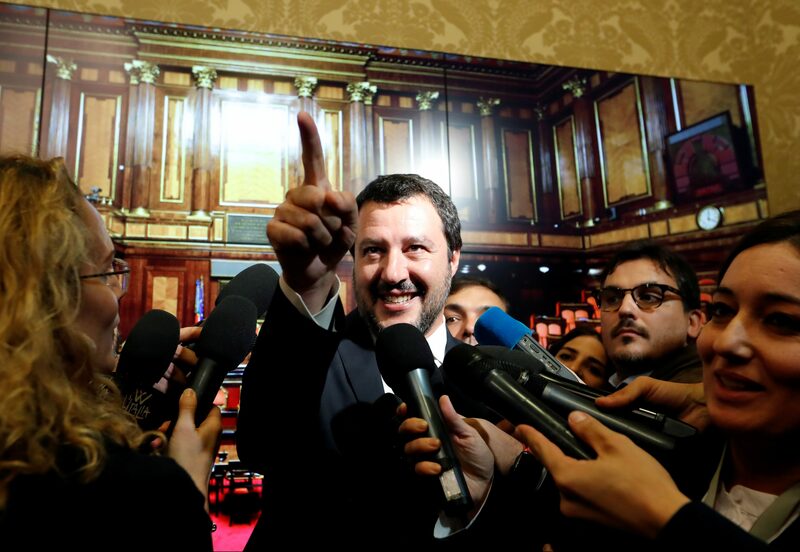 Since the anti-immigration party of Matteo Salvini and the anti-establishment 5-Star Movement became coalition partners in May, foreign investors have been net sellers of Italian sovereign bonds. Their share of Italian government securities fell in August to its lowest since March 2014. Italian banks held, together with state lender Cassa Depositi e Prestiti (CDP), about 18 percent of outstanding government bonds at the end of June, according to the Bank of Italy’s Financial Stability Report in November. Excluding CDP, the figure was 320 billion euros at the end of September. For every 100 basis points of increase in the spread, the common equity Tier 1 capital ratio of large Italian banks – a measure of financial strength – falls on average by 40 basis points. For smaller banks, the average hit is 90 basis points. A 100 basis points rise in the BTP-Bund spread also translates in higher funding costs for Italian banks equivalent to 40 additional basis points on fixed-term deposits and repos and 100 additional basis points for new bonds, the Bank of Italy says. The League commands 32.3 percent of voters’ preferences, according to an average of opinion polls in Italy in the week to Dec. 1, with some pollsters giving it as much as 34.5 percent. This compares with the 17.5 percent of votes it got in the March 4 vote. Its coalition partner, the 5-Star Movement, scored an average of 26.3 percent in the polls, against nearly 33 percent of preferences in the general election.